VTel’s sister company, VTel Wireless, is building a 4G LTE wireless network across Vermont and parts of western New Hampshire. Our goal is to bring affordable high-speed Internet to the most unserved and underserved areas of Vermont. We’ve invested over $100 million of our own capital and $35 million of capital from the federal government to build this network. VTel Wireless, which is now nearly statewide, is a separate service from the VTel landline service area, which serves 14 towns in southern Vermont. VTel Wireless is an Internet service and does not transmit traditional television, landline phone, or cell phone signals. In the near future, voice calling will be possible with cell phones over the VTel Wireless network using VoLTE (Voice Over LTE) technology. I’m a VTel landline customer. Can I get VTel Wireless service? Yes, you can! See plan information here, and contact VTel Wireless at 802-885-4444 to get on the network. FREE for 1 Year! Current Vermont Telephone customers with at least an Internet account can have access to our network with a 2GB data plan and pay nothing for it for an entire year. Take your high-speed connection anywhere in VT! You can always be connected whether you’re on fishing trips, camping, hiking, or relaxing in the park. 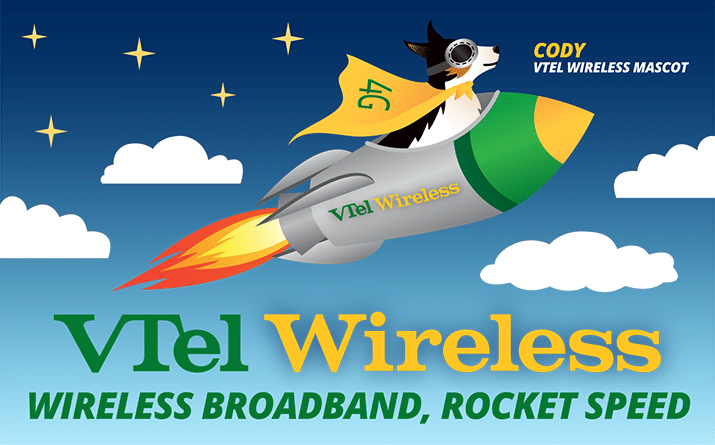 Get a 50% discount on all VTel Wireless plans. It’s a great way to save money if you have a second home in Vermont—never pay two Internet bills again! Your statement comes as one uniformed bill from Vermont Telephone Co. and you don’t need to sign up for a new account or go through a credit check. A one-time programming fee may apply.